Originally published by SafariBookOnline Magazine on 24th of February, 2012. The W3C added the Media Query as part of the CSS3 specification, thus improving the use of media types. A media query allows you to target not only certain device classes but to actually inspect the physical characteristics of the device rendering your work. After the viewport, you need to write the HTML5 code designing the WebApp layout. For our purpose let’s show an <img> element. After writing the HTML5 code we can work on CSS3 media queries code targeting the different devices according to the project requirements. In this example, we will target the iPhone 2, 3 and the iPhone 4 and 4S. 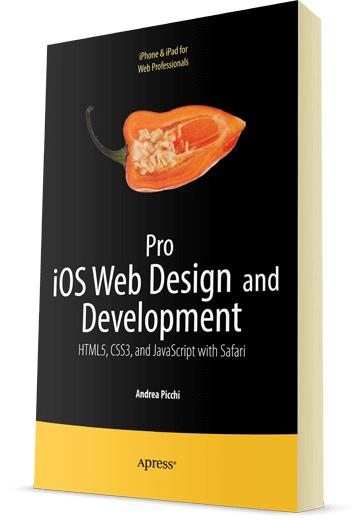 media="screen and (device-width: 480px) and (orientation: portrait) and (resolution: 163dpi)"
The logic behind the CSS3 approach is the use of one image at 100% for each device in order to fit its container element in both portrait and landscape orientation. The possibility to target a device in two different orientations also offers the possibility to create an ad-hoc fixed element layout and bypass the need to rely on fluid structures. This is a solid approach every time you need to design for a specific device like the iPhone. This responsive design approach will help you design user interface elements that will fit both portrait and landscape orientations, thus increasing the level of user experience of your WebApp.